Andorra has always been a paradise for skiers. The little country between France and Spain consisting basically in a busy street plenty of shops and hotels is now getting into the cycling world. 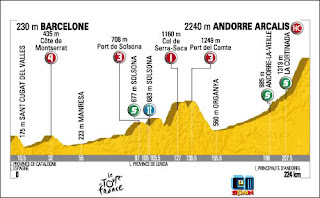 In fact the history of Andorra and cycling is pretty old starting in the '60 when Tour de France arrived to Andorra via Port d'Envalira in a famous stage (year 1964) in which Jacques Anquetil was dropped of the group. 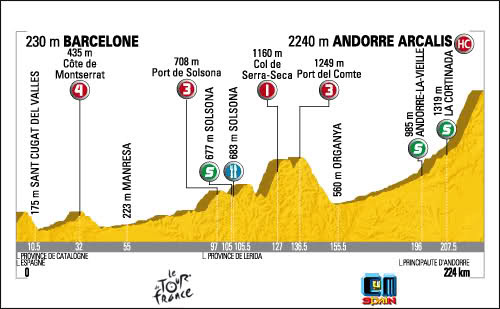 But it has been recently that Andorra is also becoming very popular as a living place for many professional cyclists. Obviously it is a fantastic place to train in the mountains. Also, a good place to pay less taxes (Andorra is reputed as a tax free country). - Port d'Envalira, 2407 mts height. The highest asphalted road in the Pyrenees. Pity that it is a pretty busy pass between France and Andorra, specially on the south side. The top is filled with Oil Stations and shops which makes the top very little appealing for cyclists. The climb from Ax les Thermes is, nevertheless, a much more interesting road, which gets to the top in 35 km with an elevation gain of 1700 mts. Not many climbs have these numbers! - Port de Cabus: 2300 mts. A road leading to Pal (village and ski station) and afterwards to Coll de la Botella. Then the roads leads nowhere with summit at 2300. From that point you can get a gravel path to Catalonia. Said to be a smuggler way (to get tobacco out of Andorra). - La Gallina. Recently asphalted on both sides, La Gallina has become one of the most important and steep climbs in Andorra. Very popular also thanks to the Granfondo "La Purito" celebrating in August. A monument dedicated to Joaquim "Purito" Rodríguez is on top of La Gallina. Vuelta a España arrived for the first time to La Gallina on 2012 (winner Alejandro Valverde), then also arrived on 2013 (winner the italian Daniele Ratto) 2018 (winner Enric Mas). - Collada de Beixalis: Also a recent discovery for cycling and the perfect mate to Coll de la Gallina (this is why they are usually included both in same stage). Very steep as its brother, but a little shorter. 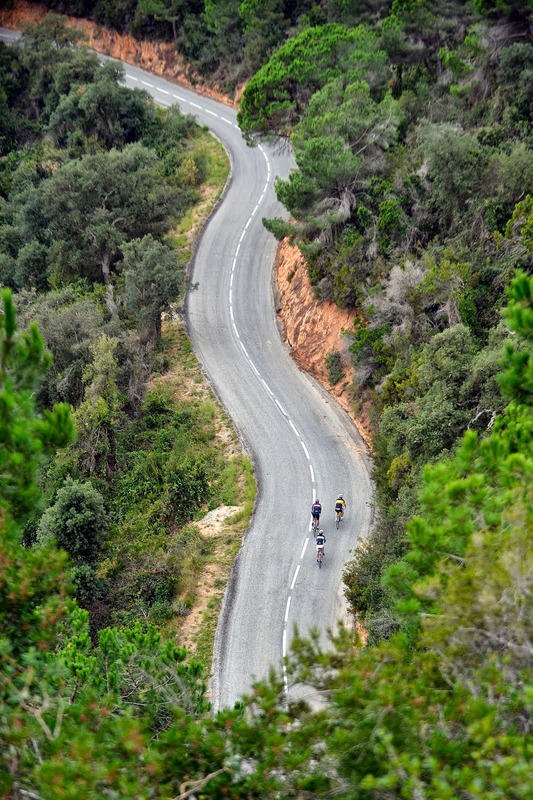 - La Rabassa: A classic climb from Sant Julià de Lòria with 2 sides doing a loop. At the top of Bosc de la Rabassa there is the Naturlandia Adventure Park. It has been stage ending in Vuelta a España 2008 (winner Alessandro Ballan) and 2018 (winner Thibaut Pinot), and has been included in stages a number of times. 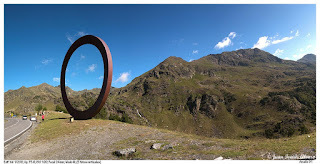 - Ordino-Arcalis: Summit at 2225 mts height, Ordino Arcalis has been stage ending several times in big tours. The most important ones are of course the Tour de France 1997 (memorable Jan Ullrich victory in stage Luchon Andorra), 2009 (stage Barcelona-Andorra, which winner was Brice Feillu), 2016 (Tom Dumoulin winning in the rain). Also Vuelta a España arrived to Ordino Arcalís years 1994-1999-2000-2001-2005 and 2007. - Coll d'Ordino. 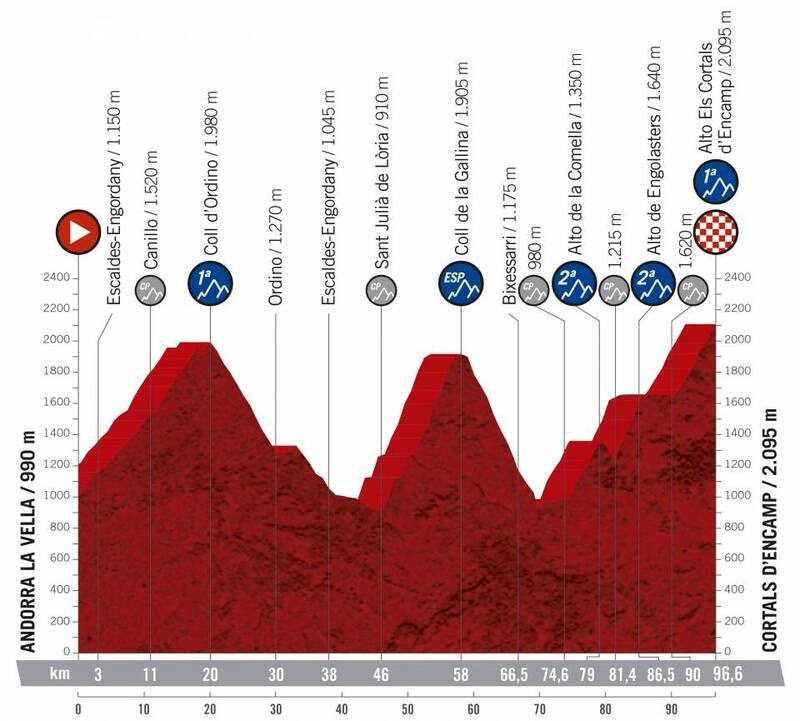 If I have to choose one climb in Andorra it would be Ordino. Beautiful twisty scenic solitaire road. And as most of the climbs in Andorra every km you have a road sign indicating the km and the gradient. Not to be missed. - Engolasters and La Comella . Engolasters is a nice lake close to Andorra la Vella. First time climbed in Eddy Merckx times when the Setmana Catalana multiday race took place on the '70. Not very steep, not very long, but nice anyway. 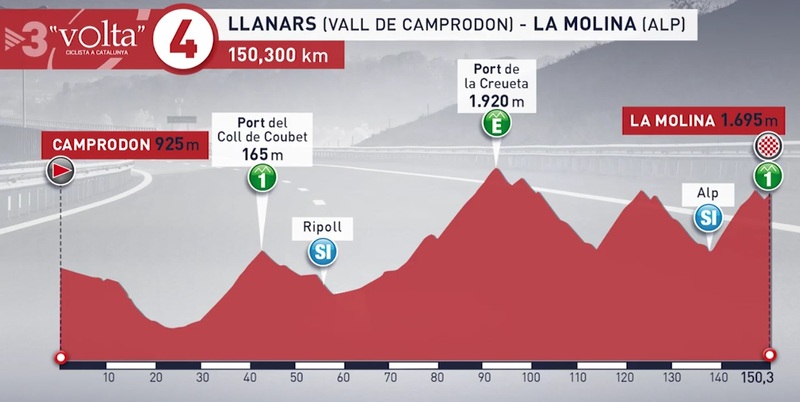 La Comella and Engolasters will be included also in Vuelta a España 2019 including a gravel road for the first time in Vuelta a España. 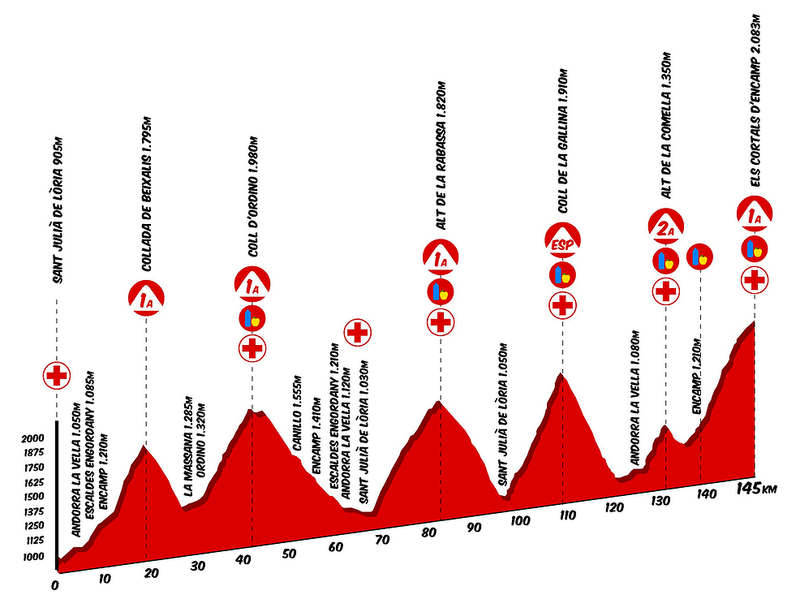 Most of the climbs described are included in the Granfondo "La Purito", disputed every August since 2017 with a very demanding route (5200 meters elevation in 145 km). If you are searching for a Challenge, this might be your best choice. 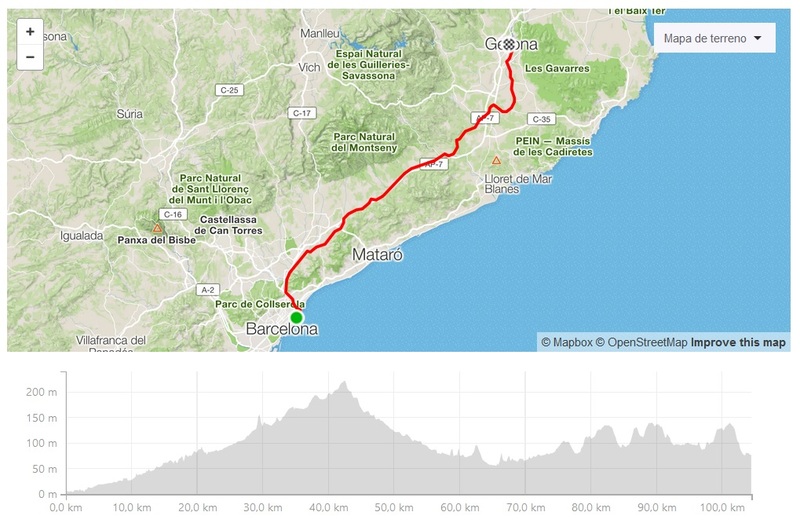 Cycling from Barcelona to Girona is a nice challenge, very doable in one day. Putting together the big metropolis of Barcelona with the small Girona, capital of cycling. Once in Girona you can take the train back to Barcelona. Trains in Catalonia work very well, fast, clean, on-time, therefore in just about 1 hour you are back to Barcelona. Unfortunately, with the bikes you cannot take the high speed train (AVE), otherwise, you would be back to Barcelona in hardly 40 minutes. The fastest way to do it in a road bike would be in inner and mostly flat roads. 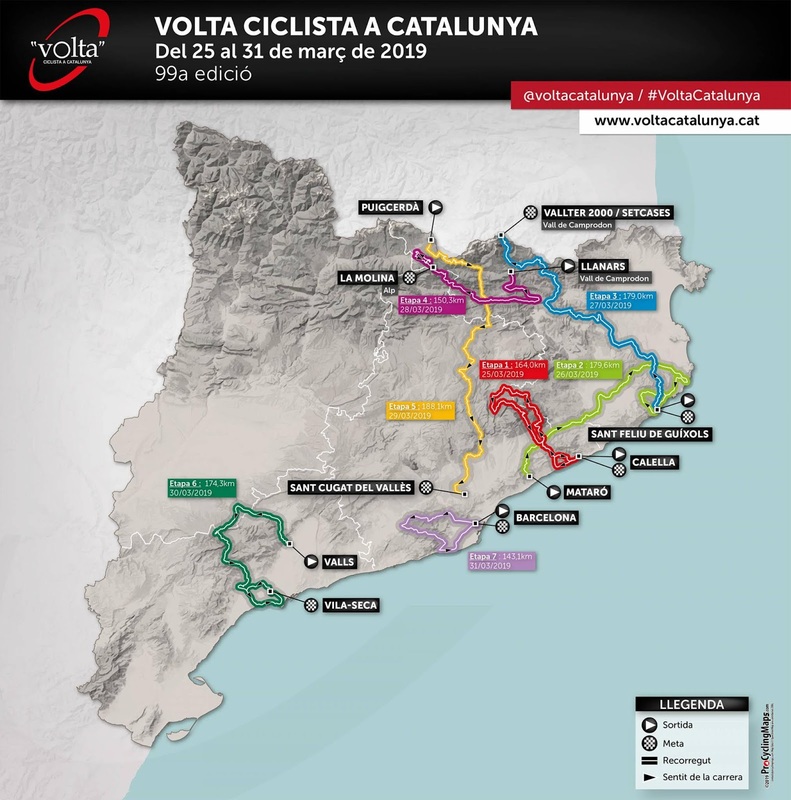 The key roads are BV 5001 (Carretera de La Roca), C-35 (road to Hostalric) and then leading to Caldes de Malavella, Sant Andreu de Salou, Fornells de la Selva and Girona. But the route we suggest today is in some gravel paths and solitaire roads. Very safe and adventurous way to get to Girona. For some parts you will take the very popular greenway 97 km long that links the Pyrenees (Olot) with the coast (Sant Feliu de Guixols). Lovely path that we take for some km on our way to Girona. 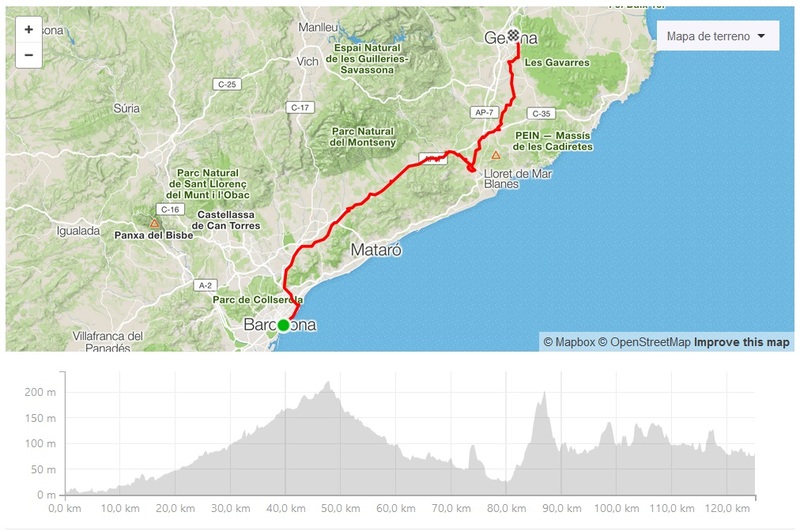 If interested in any of these rides and also in bike rental (being road or gravel) you can contact us at https://roadcycling.barcelona/bike-rental/ . We can also provide the gpx files to upload to your gps device. And now, by the way, it is good to remember that in 2009 Le Tour de France did a stage Girona Barcelona, in 181 km. 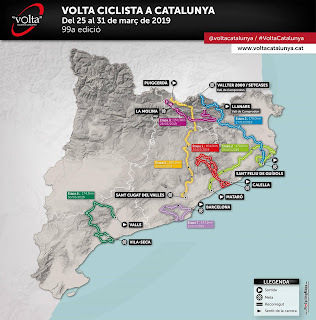 This is a very good choice for die-hard cyclists, getting some of the best roads in all of Catalonia (coastal road from Sant Feliu de Guixols to Tossa de Mar), and also some nice climbs close to Barcelona (Collsacreu, La Conreria). Multiple choices to put together by bike those 2 nice catalan cities! Steep road leading to Burdinkurutxeta! One of the nicest things about the Transpyrenees cycling trip is that you can fully customize the trip depending on your needs. The only mandatory thing ig getting from the Atlantic ocean to the Mediterranean sea, or opposite, from the Mediterranean Sea to the Atlantic Ocean. Of course Tourmalet is one of the highlights of thr trip! The classical Hendaye Cerbere trip is organised by the french Cyclo Club Bearnais, based in Pau. It is a fixed route with 720 km that must be done in less than 100 hours. Such a challenge! 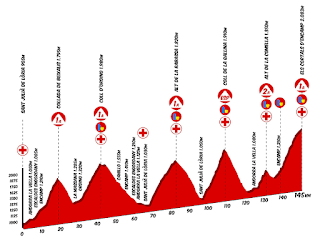 The route includes some of the very big climbs such as Aubisque and Tourmalet. Unfortunately it includes also some busy roads as Col de Puymorens which is not exactly the type of experience a cyclist would like when riding in the Pyrenees. The classical Hendaye Cerbere Transpyrenees card! As said before, there are many different ways to plan this trip. First, let's say that the right direction to lead is going back home. Then, for a catalan rider, it should be west to east from Atlantic to Mediterranean. For a basque cyclist the opposite, from Mediterranean to the Atlantic. For a foreigner similar thing, if you are flying back home from Barcelona you should make weat to east, ending in the Mediterranean. Simple answer to this: once you ended the trip you don't want to get a train or a car for 700 km more! Planning the trip is part of the same trip. You can make the trip as long as your vacation is, and you can also include as many famous climbs you want. 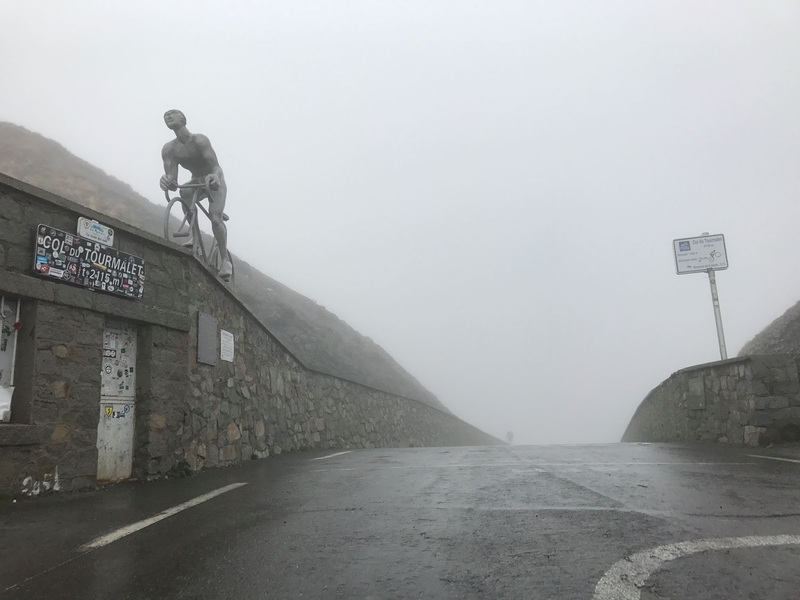 If you are travelling along the Pyrenees you don't want to skip those famous mountains as Col du Tourmalet, Aubisque, Aspin, Peyresourde... Those are the classical ascents! But during the years just by watching the Tour de France stages you see that you have a lot of possibilities. 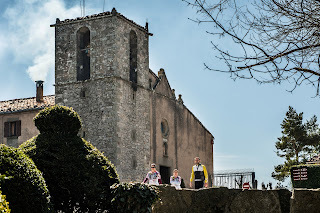 Let me suggest a couple climbs which are between the nicest in the Pyrenees and should be included in every Transpyrenees trip: Port de Bales and Port de Pailheres. A very good choice is doing the trip in 7-8 stages about 100 km long. The Hendaye Cerbere and most of the usual Transpyrenees trips go along french roads, but the spanish side is also plenty of nice choices. Just let me point amazing and beautiful ascents as Port de la Bonaigua, Coll de la Creueta or Coll de Cantó. Also, some of the ascents which are just on the border between Spain and France: Pierre St Martin and Port de Larrau (terribly steep!). More things: There are basically 2 ways of doing the Transpyrenees trip: supported (with a sag van) or selfsupported (with a rack and panniers). First one is about lightness, safety, being confortable, riding faster, having suport in case of bad weather. Second one is about adventure, adventure and adventure. You choose!! The route has plenty of attractions. Every day there is something interesting in the route, being on the sportive side, being on the touristic sid. And what about the participation? Some of the best cyclists in the world are expected to attend: Alejandro Valverde (world champion), Chris Froome (4 times Tour de France winner), Romain Bardet, Thibaut Pinot (Giro di Lombardia winner), etc. Stage 1 Calella Calella, 164 km getting to our beloved Montseny mountains. 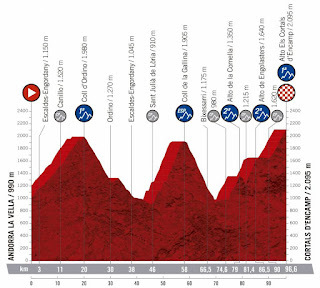 The climbs to Coll Formic and Santa fe del Montseny will be the highlights of the stage. Stage 2 Mataró-Sant Feliu de Guixols, 179 km Sant Feliu de Guixols is one of the nicest towns in Costa Brava. 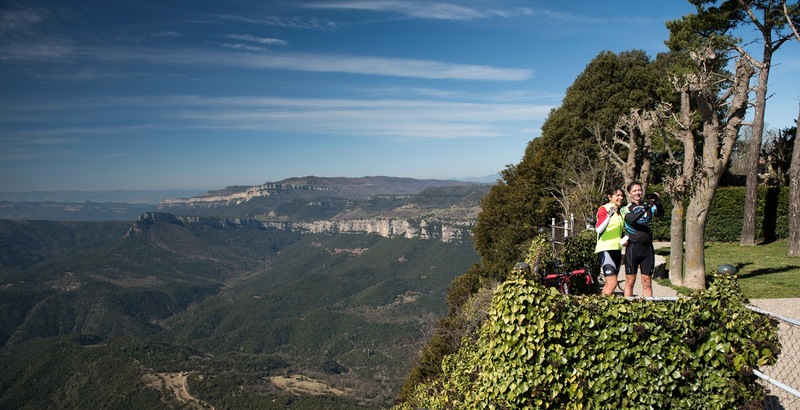 Guaranteed breathtaking views during the stage! Nice stage by the coast! 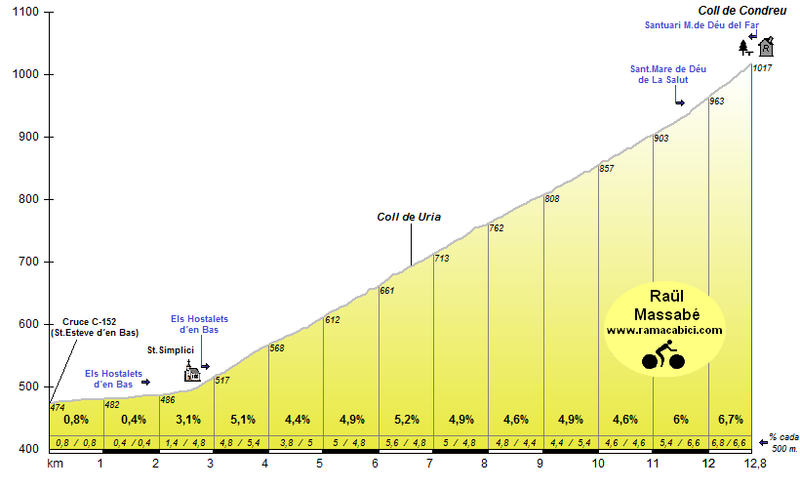 Stage 3 Sant Feliu de Guixols-Vallter 2000. 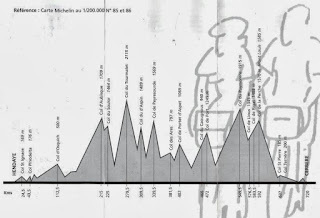 179 km with a very demanding final climb to Vallter 2000, and a couple of previous first category climbs. This could be one of the key stages, and teams should be ready for some cold in the Pyrenees, late March! 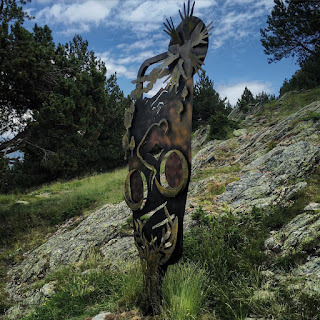 Stage 3 Sant Feliu de Guixols Vallter 2000, in the Pyrenees! Stage 4 Llanars-La Molina, 150 km. Another stage in the Pyrenees including one of our favourite climbs in all the Pyrenees: Coll de la Creueta, amazing landscapes! Arrival to La Molina, already included several times in the Volta route. Stage 5 Puigcerdà Sant Cugat del Valles 180 km. Stage descending from the Pyrenees to Sant Cugat, very close to Barcelona. 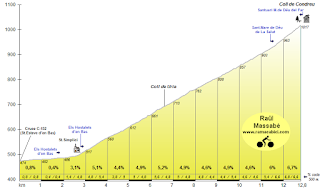 Collada de Toses will be climbed outside Puigcerdà, at the beginning of the stage. Stage 6 Valls Vilaseca 174 km. Arrival to the famous Costa daurada, paradise for cyclists, including towns as Cambrils and Salou. Stage 7 Barcelona Barcelona 143 km. 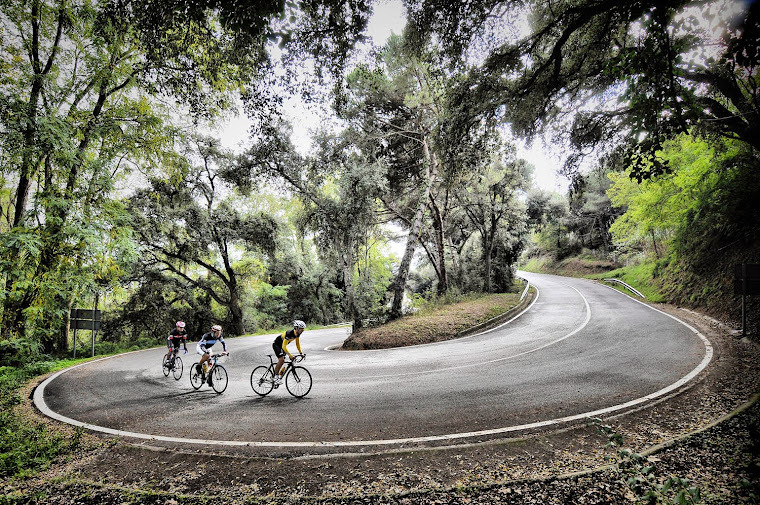 Final stage arriving to Barcelona including the steep (but short) climb to Montjuic 8 times! Spectacular ending at the city center. Family vacation, lot of fun! When planning a cycling vacation for the family things are a bit different than planning a trip with friends, aren't they? In Catalonia we have several options if we would like to do a family cycling trip, but the most appealing is the so known Ruta del Carrilet. This route, 97 km long, follows a former train line from Olot to Sant Feliu de Guixols. This route, mainly graveled, but also asphalted for some parts, is a great and safe way to discover the best cycling paths around. 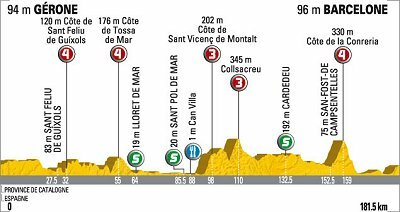 On top of that, the very famous Girona is half way, then it is very easy to put together a trip in 2 stages sleeping in Girona half way. This trip, going from Olot to Sant Feliu de Guixols, slightly downhill, is very easy, perfect for beginners or small children. 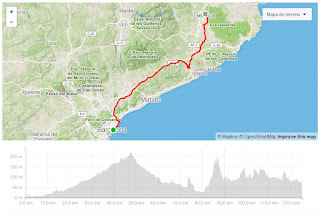 On the other way, from the coastal Sant Feliu de Guixols to Olot, in the vulcanic region of La Garrotxa, is slightly uphill, a bit more difficult but also doable in 1-2 stages. Also very interesting the fact that the former train stations have been converted into hotels and restaurants. This way, we have plenty of nice options to rest for a while and have lunch just aside of the path. Santuari del Far, an amazing spot to get on the bike! When you are cycling in Girona you have so many different choices. Climbing is our passion here, then everybody knows about Rocacorba, Mare de Deu del Mont, possibly Vallter 2000. You can reach all of them from Girona. But there is a climb, not-so-known, probably because it is not as demanding as those mentioned, that deserves a visit. Totally worth. It is Santuari del Far, an amazing spot with unbeatable views of the mountains around. You reach this spot from Coll de Condreu, a very interesting climb reaching 1017 mts. On the west side, starting at Manlleu you will cross tiny medieval villages as Rupit and Pruit, and from the north side starting at Sant Esteve de'n Bas you have a nice wide, well asphalted road. At the top, just beside the roadsign there is a crossroad leading to Santuari del Far. Nice tiny narrow road which in about 5 km leads to the Sanctuary. Not very steep, a doable climb! When you get to the top you will find the Sanctuary, an amazing viewpoint that will leave you breathless and also a nice restaurant where you can stop for a while and get a coffee or maybe lunch. Come to Catalonia and we will help you to discover amazing spots like this! Port de Pailheres, spectacular climb in the Pyrenees! Port de Pailheres, such a climb! Port de Pailheres is possibly one of the nicest climbs in the Pyrenees. A bit out of the way of the more known climbs in central Pyrenees, Port de Pailheres is an amazing climb, also with personality, starting with very steep slopes in a long stretch of the road, then we have a very nice part with many switchbacks very close to each other, and finally a superb scenic road for the last 3 km. Port de Pailheres has been included in Tour de France route 5 times so far, in 2003, 2005, 2007, 2010 and 2013. 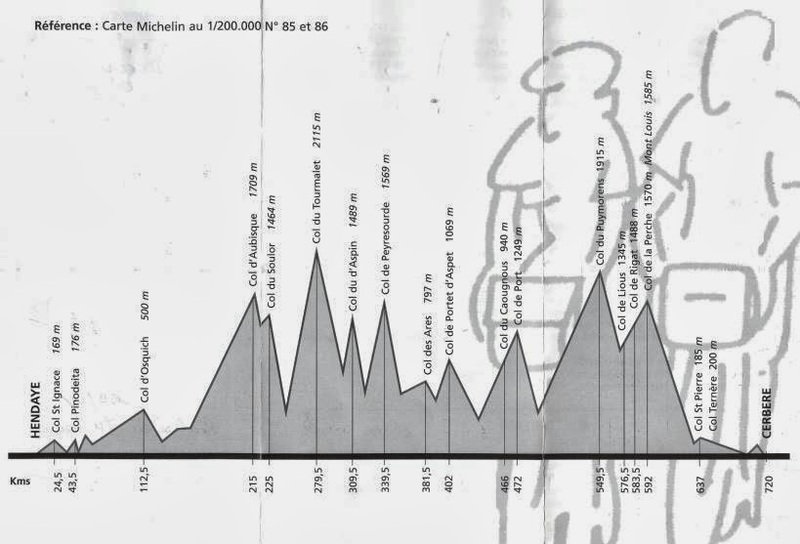 In all these years, Port de Pailheres was the last but one climb in the stage, and was always climbed by the eastern side starying at Usson les Bain. Its privileged location, arriving to Ax les Thermes, permits a final climb to Plateau de Bonascre (Ax 3 Domains) or Plateau de Beille. The views from the top are spectacular! Let me recommend a very nice loop in which you can include Port de Pailheres and also Col de Pradel, a not-so-steep climb in a tiny solitaire road getting to 1680 mts. Loop about 85 km long is really nice, but watch out, almost 2500 mts elevation! Mandatory picture at the summit! Visit our website! www.roadcycling.barcelona !! Cycling in Penedes, riding in Falcon Crest!